If you’ve never had a compulsion to buy a Rolex, Breitling, or some other watch whose name you’re probably mispronouncing, then adding smarts to a “luxury” watch isn’t going to change your mind. In fact, it could actively dissuade you. If the idea is to own something passed down through generations, the momentary cutting-edge lifespan of most gadgets (two years, if you’re lucky) makes the Tag Heuer Connected a laughable proposition. Mainly because the Tag Heuer doesn’t excel at anything — it’s all around good, but not great. It’s not the best-looking watch, that arguably goes to the Apple Watch or maybe the Huawei Watch depending on your preference. It’s not the longest lasting either — that distinction is Pebble’s alone. And it’s definitely not the cheapest. Not even close. But this is the world’s first smartwatch made in partnership with a company that actually makes luxury watches — not a tech company pretending it has fashion sense — so in a way, it’s the first of its kind. So what does the Tag Heuer Connected actually get right? Well, a couple of things. The biggest one is that the Bluetooth connection on this watch is solid. I’ve often found that the required connection between my phone and watch can be spotty with most Android Wear or Pebble watches, but the Connected never blipped or dropped a connection. Second, the watch face looks great and the watch is able to display a low-power watch face without sacrificing too much battery. So at the very least, you can always see the time — no wrist-flicking required, and the full 360-degree display means you can see it perfectly from any angle. But if you’re going to count pixels, you’ll be disappointed. For such a big screen 248 pixels-per-inch is too few. You can make out each individual pixel clearly. It can be a little distracting and it’s also far fewer pixels-per-inch than the Apple Watch and other wearables, so the screen ends up looking less stellar than much cheaper competitors. 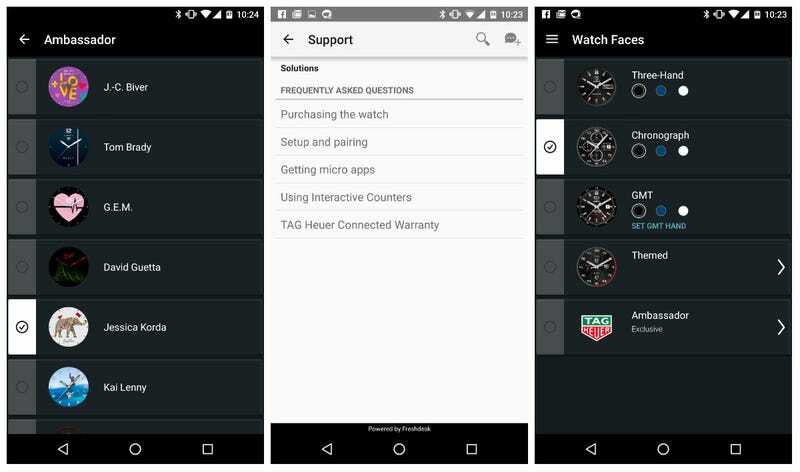 The small UI additions, including free luxe watches faces through the Tag Heuer app and slight colour changes to the apps menu, makes for a wonderfully fantastic watch. If the Connected cost just a few hundred quid, and you’re already a fan of big and bulky timepieces, you should’ve bought one yesterday. But that’s not what we’re dealing with here. We’re talking about £1,000+, and while that is mildly cheap compared to some Apple Watches, it’s still a hefty price that needs to check off a few “must haves” to be worth it. 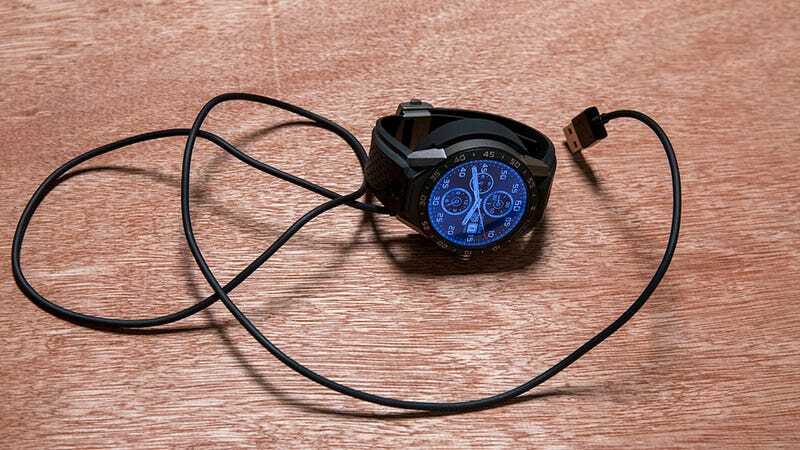 Although the watch’s Intel chip makes it technically capable, it still missing some features less expensive watches have, like GPS, a heart rate sensor, or a speaker that let’s you feel like a double-O agent. With Android Wear now supporting speakers in its latest update, it’s something you’ll probably want! If you use the watch with any amount of regularity, you’re only going to get a day of battery life plus some change, maybe two-days if you’re more of a lasseiz faire watch owner, in which case I’m not sure why you have a smartwatch to being with. That a big battery makes for a big watch. The watch is 12.8mm deep, the bulkiest Android Wear watch there is. My wrists are rather small so it looks ridiculous like all big watches. But even for those who love the bulk, the Connected watch is pushing it. However, the most confusing detail are the watch materials. If this watch was cheaper (like I so wish it was), the materials would make sense: Steel frame, plastic back casing, and a rubber band. But not £1,100. Never £1,100. Friends would often slack-jawed, eyes popped-out like Arnold on Mars when I told them the price. 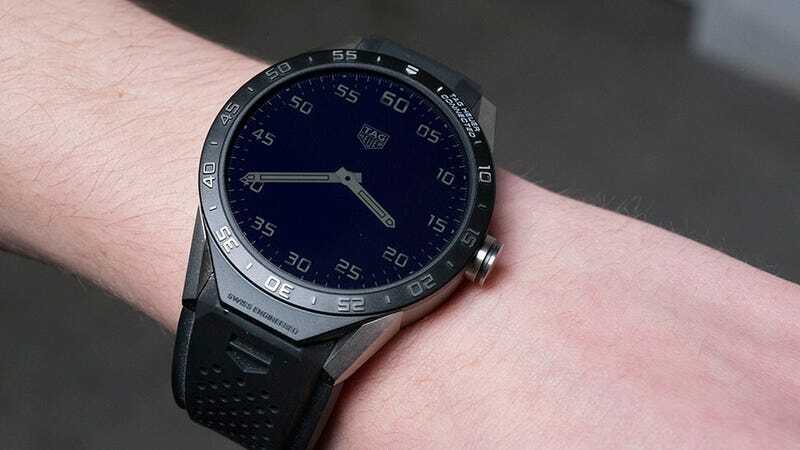 If the Tag Heuer Connected is a vision of the luxury smartwatch future to come, watchmakers are going to need to get more creative to deliver something worth such pricey purchase. Tag Heuer’s idea of replacing the watch after two years for a special edition mechanical watch is a start, but the additional dosh required to buy in isn’t a solution for anyone outside of the watch collector community. 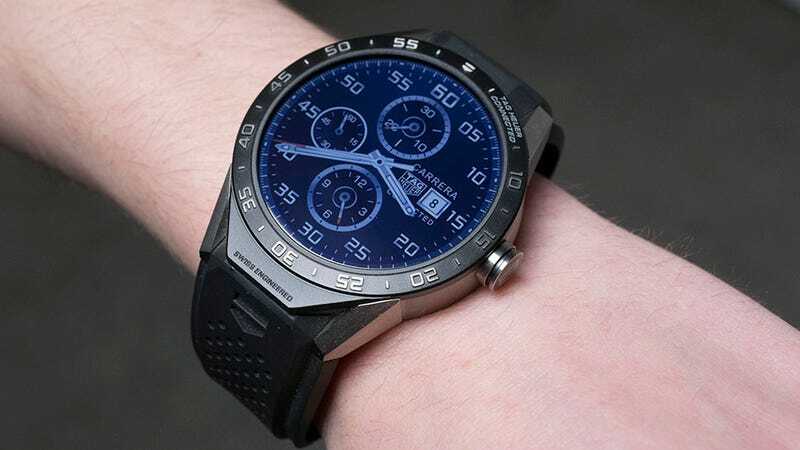 When CEO of Tag Heuer Jean-Claude Biver said his company was getting into the smartwatch game, he promised that whatever they’d do it’d be “first, different and unique”. The Tag Heuer is none of those things. Hopefully version 2.0 can live up to that original promise.